An appetite for design. Independence Prime, the steakhouse and bar at the Philadelphia airport, designed by Daroff Design. Food, glorious food. I love it—and I love to eat out. That’s why I get particularly excited whenever I’m asked to photograph a place where people meet to eat. A five-star restaurant, a neighborhood eatery, even a branch of a casual fast food chain—it doesn’t really matter. The environments created by people who cook for people who eat have always fascinated me. Talula’s Daily: lunch time grab and go. I’ve photographed an endless number of eateries. As far as actually working in one, I did spend a summer before college cooking up fries and roast beef sandwiches at Arby’s. That’s where I learned that you don’t always want to know how or where your food is made. 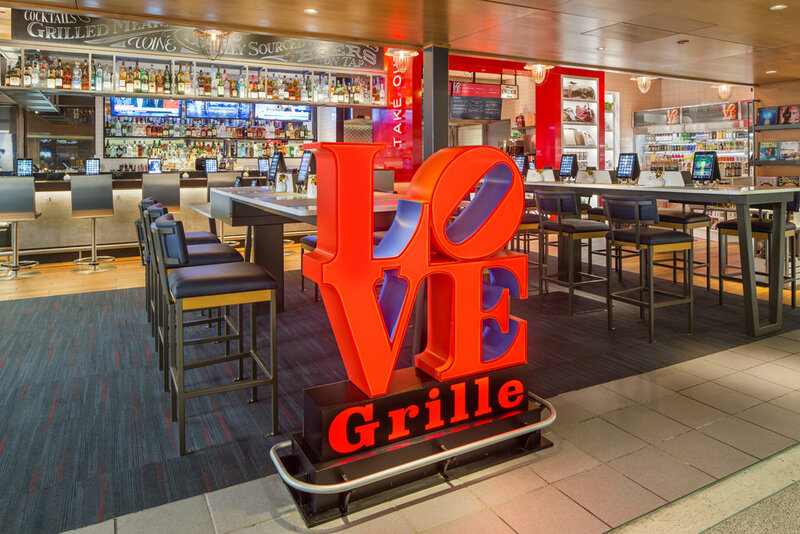 Love Grille with the iconic Love statue logo, features Philly cheesesteaks. I much prefer shooting “in the front of the house.” As a photographer of architecture, I like to be able to control the situation—and, as we all know from watching countless cooking shows, that’s not always possible back in the kitchen. So many choices, so many lines. Lunch at Houston Hall at Penn. But whether or not I include people in my shots is usually decided by the nature of my audience. The curvy undulating ceiling of Independence Prime draws you into the bar and restaurant. All of the pictures of restaurants, cafes and casual dining spots you see here were taken from the client’s POV—and each tells a unique story or part of one. My architecture and construction clients prefer the emphasis to be placed on the look, design and physicality of the space. Real people require real food. I’m not above treating students to a meal to get the right shot. Neighborhood places should reflect the neighborhood. My editorial and academic clients want to see people enjoying good food, drink and the company of other people, promoting a sense of community within neighborhoods and on university campuses. I see fed people. Students eat and socialize at Penn’s New College House. Dine and dash. Baba Bar, an on-the-go bar and noshery at Philadelphia airport. Me? I’m just here for the food—and drink.